my BINTULU clicks: Dutch Tuber in Bintulu. 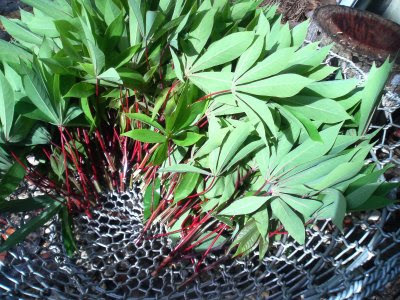 The above are young tapioca leaves just harvested at my farm this morning. Tapioca ( Manihot Esculenta Crantz )are a worthwhile plant to have in our immediate vicinty. They belong to the family of Euphorbiaceae. From its roots we get tubers that can be boiled and eaten with honey, sugar or meat including fish. They are alternative to eating rice or bread. The young leaves are plucked from its soft woody stems as salad or prepared with coconut milk as vegetables. In Bintulu these leaves are sold at the tamu or local jungle produce market at very reasonable price. For example the quantity above could be sold at RM 1 and would be enough for two or three persons eating. Locally tapioca is called 'ubi kayu' or 'ubi Belanda'. 'Belanda' means Dutch in Malay. The later name suggests that tapioca was indeed brought by the Europeans to this region from where it originated i.e. Tropical America.